Hi there. I've been reading all the different threads on harnesses and wanted advice on the best for daily walks and trail walks. So far I've only ever used a collar and leash for walking but am thinking of switching her to a harness. She doesn't really pull a lot when she walks but I want something secure that doesn't pull at her neck anymore. I have seen some of the popular ones on here are the ruffwear and the the easy walker. Also do any of these work for securing them in the car for safety while driving? I've used puppia and ruff wear before. They are both pretty good although if you are going to be doing a lot of stuff like hiking I'd recommend ruff wear. Not sure about the car thing though. Pretty much any regular style harness (not the 'no pull' designs) can be used for restraint in a vehicle. However, you probably want to get one that is somewhat padded if you are going to be using it in the vehicle. I really like the Ruffwear Webmaster harness. It is pretty much escape proof and is incredibly durable. Plus it has a handle, which comes in very handy for many different situations (i.e. hiking over rough terrain, catching a dog that has neurological defects as she falls for the millionth time, or snatching up a reactive dog when an off leash dog (or kid) approaches). Thanks for the advice. Is the Ruffwear padded enough to use in a vehicle? I was in a car accident a couple years ago and luckily she wasn't in the car with me at the time but I have a fear of her getting hurt now. Might not be able to find something that works best for both. If you're really worried about a car wreck and safety, Champion car harnesses are crash tested. Plenty of padding on the ruff wear and if you want you can pass the seatbelt through the handle to secure your dog in or attach a restraint to the rear loop. The "ruff wear webmaster" has a chest strap and abdominal strap which equally distributes the weight of a dog. The thing I like most about the webmaster is that dogs cannot back out of it. My guys have escaped one too many times with other harnesses. So far never in the webmaster and I am pretty confident that they will not. FYI, Ezydog has a harness that clips into the seat belt buckle and has a handle too. My only concern is that they could back out of it and escape. I have them for my two before I changed vehicle from a regular sedan (where I did not have enough space to put 2 crates in) to a wagon. It is very sturdy and heavy duty looking and seems to provide the best safety features in the market. I currently have 2 wire crates in my car, but still have the Champion Seat Belt Systems in case I need to take out the crates to make sure the dogs are safe riding in the car. I use my old RuffWear harness for everything. Daily walks, hikes, rides in the car... It's great. I do have others but don't use them anymore. For puppies, my trainer is of the opinion that simply a collar and leash is best, or a haltee, or the ez walk harness. She was telling is that as a puppy their shoulders and chest muscles are not well developed enough to handle a traditional harness. Of course, that was only one professional's opinion! There are many different opinions out there, I just thought I would toss out what I had learned! Thanks for all of the info everyone! Sounds like the RuffWear is tested and approved for everything I need so will be looking into that one first. Wicket is 3 1/2 so she is fully developed...I just know its going to take a lot of positive reinforcement to get her used to putting it on and wearing it!! @kijoh: I'm not sure I understand what their shoulders and chest muscles not being developed enough for a traditional harness means. What impact would how developed the are have? @karayvette, With the harness, along with positive reinforcements (treats and what not) try to distract her so that she forgets she's wearing the harness. That helps her adjust to the harness quicker. First time I put the harness on Bootz, she just froze and stood there, even if i had tasty treats. It took Bootz a while but when I took her to the dog park (her fav place), she forgot about it and just acted normal. Now she still runs away from the harness, but once its on her, shes perfectly fine. @notoriousscrat she was telling us that since a harness pulls at the chest and shoulders, it makes a difference with how strong they are. Bit again, I'm not an expert! I use an EasyWalk harness for everyday walking. I have a Ruffwear Webmaster but feel that it is too bulky for everyday walking and reserve it only for hikes and etc. We use the EzyDog chestplate harness with Bella for both the car and daily walks. It comes with a seat belt attachment, and I paid approx $aud30. I'll be getting the next size up of this product when she out grows this one! Much more comfortable and less restrictive/heat trapping for daily use I like the cloak and dawggie harness's i will picture below..
How is the second harness for their coat? The ezydog isn't kind :( going to try and replace it tomorrow. Webmaster for hiking and another softer one for daily once she reaches full size! Actually, don't know of I'm keen on Velcro! I just ordered the EzyDog Quick Fit Harness for Bruce. I'll let you all know how it goes. He's about 6 1/2 months and the cheapie harness we bought for him as a puppy is ready to be retired. The RuffWear seemed like a bit of overkill for what I need, plus the EzyDog Quick Fit was only $24... so if he outgrows it I won't be too heartbroken. @Kitsu The collar is relatively thick but is well broken in and very flexible, it was my now departed Siberian husky's daily collar.. I bought that collar 12 years ago for her after she was attacked by two off leash dogs one day while we were off walking by the river. Seeing your dog with a pit locked on her throat and a rottie hanging off her front flank makes one able to see the value and defensive beauty of a big heavy collar like that. had i not been able to defeat the pit immediately there could have been serious damage if not death in store for my innocent dog. The collar has since been retired because there is no way to attach Bo's tagg tracker to it. i suppose i had bo wearing it for sentimental value as much as anything else. @Ryan. The harness is great! no coat problems and it doesn't retain heat. we like it co much we have two of that same harness. The Ezy Dog Quickfit Harness is actually pretty nice. I got Bruce a medium and it just barley fits him. He's got a lot of room to grow in the stomach band, but the chest strap is at it's limit. The harness is solid on it's construction, and really, really, easy to put on. Once it's been setup it takes 2 seconds to slip on and off. Only issues is that there is no neoprene on the strap that goes underneath his stomach, and can rub a little raw. In all, you won't find a harness that's easier to put on, and for what I paid I'm very happy. I will probably just sew some sherpa on the lower portion of the stomach area for comfort. Couldn't get the Ruffwear here in Japan, but the Ezy Dog harness was available... and it works perfectly well. Easy to snap on (Ponta walks up to but not over it, then holds still while we lift his front up and plop him down so his feet are in the harness, then snap-snap), and that chest pad seems to work well. With the old harness, whenever he strained it seems like he was going to choke himself; the Ezy Dog has pretty much eliminated that. In my last post I said I bought Bruce a medium, but I actually got him a small. The harness has been nice, but when Bruce pulls he'll start coughing. I checked the harness out and it looks like the chest strap is resting a little high on his his chest and looks like it might be uncomfortable on his throat. I'm not sure if this is a sizing issue or if this is just how they fit, but either way I'm just replacing it with a Ruffwear Webmaster. I experienced the same with their chest plate. Binned it. New harness went on, and coughing issue stopped. Seems like it was the EzyDog harness that was causing the issue. Feel kinda bad that he endured it for as long as he did, I assume it must've felt like someone pushing on your adams apple. 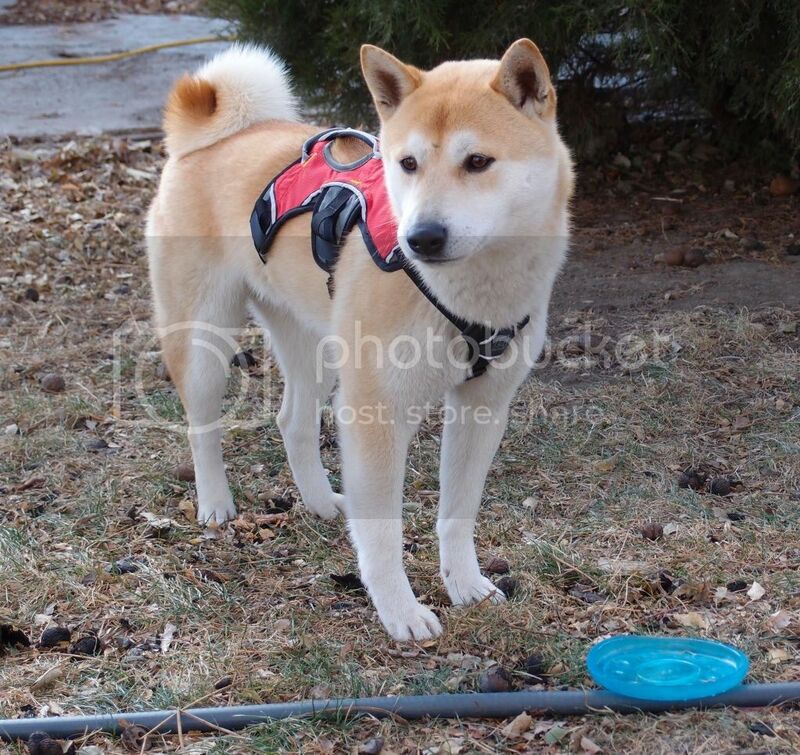 I have bought the Ruffwear Front range harness/ medium but it is too big for my shiba/ 7 months old. I use it on as front harness, but there is a big gap under his chest and it always catches his one leg. Does anyone have solution for it ? @knaoko, a medium is too big for a typical Shiba. My adult male wears an XS. Thank you zandrame but I have already purchased this on e-bay, costed nearly A$90 ! I could not try it out because I live in Australia and no one is selling it. Anyway thank you for your information. @knaoko - There is no way to safely make that work for your puppy. Re-sell it and buy one that fits. We just upgraded our pups to the front range harness by Ruff wear. They both wear a size Small. Our female is 23 lbs and our male is 30 lbs. I really like the Ruff wear harness due to its padding all around, it seems to be very comfortable and well made. Before using the front range we used the Ezy dog chest plate harness. Both can be used In the car with a seat belt attachment. Anyone use the Julius K9? If so, what do you like about it and was sizing hard? Tried two of the ruff wear harnesses and neither quite fit. Had to send them both back last winter. I noticed there is a huge size difference between the Ruffwear XS and S. I had them both at home and I compared them. I bought the XS first, based on other shibas, and it was so tight it looked really uncomfortable. I then got the S and I can make it very secure on the straps but I wish the chest area was a bit shorter, so I guess he is almost a small. What I find odd is that my dog is 10 months old and small. He only weighs 16 pounds but he must have a wide rib cage because there is no way he can wear an XS. We got the Ruffwear for Bella - she doesn't mind wearing it and it really helps with the pulling, but she HATES putting it on! It was a saving grace the day we went on a pack walk in the mountains with about 30 dogs, we met at the dog park - she was only 6 1/2 months old - and my hubby accidentally unsnapped the leash! GONE!!!!! She was racing around doing the Shiba 500 at a million miles an hour - leapt (soared) over a Boxer, which made everyone at the dog park laugh! Our friend dove after her and was able to get a handle on the Ruffwear. Thank goodness! If you ask Bella - one of the Best Days Ever! Not so much for me..... We got a picture of her right after - biggest smile on her face. @Cleo i don't think pulling is something she's going to outgrow or just get over like a phase. I think I read previously that you've tried several methods to keep her from pulling..? Not sure. I browse a lot haha. I would stay committed to some kind of training method and make sure not to switch it up or try other options to see what's most effective, stick with one and be even more stubborn than your shiba lol. I think it's important to teach your dog that paying attention to you pays off. It's worth it and fun and rewarding to pay attention to you. I've been reading the book Puppy Primer, and they talk about starting this kind of training by just being out in an area with your dog, like in the yard or on a lead in the park, etc. and waiting for them to look at you. Just waiting. And presenting them with a treat immediately when they look to you. Give praise, get excited, whatever makes your dog feel good. This is kind of a hard practice to repeat immediately cus once they know you have treats, they won't look away haha. But the idea is for them to associate looking at you by their own decision can lead to good things. And eventually you work up to having a cue word to get them to focus on you. You can show them it's more interesting to pay attention to you than whatever is occupying their mind and causing them to want to run and chase and pull. With dogs that I've owned in the past that used to pull, the second they started to pull I would stop and have them sit, and not move anywhere until they sat. If, once I have the ok, they got up and trotted ahead and began to pull rather than staying by my side, I would stop and have them sit. In the beginning, it was a lot of stopping haha. But it was really effective for the dogs that my family had. These weren't shibas, though, and I have a feeling that shibas will be much more stubborn. And this would be really difficult to pull off when there's something that's just too distracting, like a squirrel that makes them go nuts or something. Hi Lilikoi, Thanks for the suggestions! We do "look at me" for focus and she is very good at "auto-sit" when we stop as well, I also do treat rewards for these and she is very good at them, but the second we start walking again - she is pulling. Many days we don't get past the house! if she is not going to outgrow this, then my question is how do I get her the exercise she needs and leash train as well? @Cleo, do you clip the leash to the front part of the harness? I have a harness that has D-rings on both the front and the back and I always use the front D-ring. Additionally, I have been tethering my pup indoors for short periods of time (e.g., hooking the end of her leash onto a doorknob for 30 seconds while I take my shoes off) so that she's learned that pulling will get her nowhere. She will feel the resistance on the leash when tethered, and just lay down and wait patiently. In my opinion, this has helped her not pull while I take her on potty walks. You can similarly teach Bella patience by using a grooming table and a "noose." Also, my BF's dog used to wear a Puppia harness that clips on the back, and he would pull until he was coughing. We had to switch him to a Gentle Leader head collar to stop the pulling because he was already set in his ways and also aggressive while on leash. It works really well! He walks right next to us, doesn't pull, and barely lunges anymore at strangers/other dogs. I'm not sure how this forum feels about the head collar but I haven't noted any negative effects. Just curious... How do you accidentally unsnap the leash? I'm puzzled. Do you have any idea why she's pulling? Like if she's too eager to get going, gets distracted and wants to chase things, doesn't enjoy walks and wants it to just get over with, etc? It might be easier to approach the issue if you know why she is pulling. She could also be very stubborn and needs a lot of time and practice put into this behavior. Once she knows you aren't going to budge, she might become more willing to accept treats and oblige haha. Especially if she learns that there is no behavior that will cause you to cut the walk short and turn around, or that will cause you to let her lead the way or allow her to run off leash (depending on what her reason for pulling is). I might try getting some exercise / energy out by playing in the house or yard if you have one, or letting her run a bit with a lead. Then go for a walk after she's already had a bit of a way to blow off some energy. With her having a limited distance to run while on a lead for a short time, like pylea said about hooking the leash to the doorknob, she can learn that pulling is futile and isn't the right way to go about trying to accomplish her goal. I've also seen some videos about the head collar and martingale collar having success, but I don't know a ton about them. But if you were desperate, I'd say they're definitely way better options than like a choke collar or something. Sometimes harnesses can encourage pulling, especially when they hook to the back, because the dog can just rest it's weight against it and pull without being uncomfortable. Front harnesses are great because they can't just put their weight against the harness to pull. The best time to address a behavior is right before it happens, so if you're walking and you notice that it seems like she's getting distracted and might start pulling, that's the perfect time to break out the treats, get her focus on you, and practice walking without pulling. These days I have her walk right beside my leg, autosit and 'look at me" - and treats. Loose leash or it's "AhAh" and we start walking backwards before she hits the end until she resets at my leg. When she has been good for a while , I say "go play" and give her 6 or 8ft, but before she hits the end or pulls I say "AhAh" and turn her back. We are getting to the point where she does sometimes slow or turn back on the "AhAh" - so some progress. I am trying to teach her no pulling - EVER - long rope or "walk nice". The biggest thing for me is all of this is GONE when we meet someone or another dog. In our neighbourhood, there are dogs and people walking everywhere! A lot of people will respect that I have moved to the side, and will let us be, but she is so darn cute that most can't resist her!!! Ahh yeah it's definitely hard when strangers and other people are totally excited and practically praising her for jumping and tugging. I'm sure they're happy that she wants to greet them. And it's interesting that she's so well behaved in the office. She knows when she can get away with it haha. It sounds like your doing a good job of teaching her though, and that she's made a lot of progress. Other people can be a wild card... You could possibly try telling them that your working on her manners or something, and ask if they'll wait to pet her until she's sat calmly. But it's such a short time of interaction, it's usually already too late once they've approached haha. Keep doing what you're doing and don't give up! She might get less excitable as she gets older, and hopefully she'll continue to improve. She sounds like a great pup. Has anyone ever clipped a leash to the front O-ring of a traditional roman harness, like this...? I'm considering doing this because I realized recently that the Wonder Walker and Sense-ation front-clip harnesses simply allow for the leash to be attached to the front O-ring. But roman harnesses are about half the price and come in all black (my preference). I tested this method out on my dog's current harness and the leash clip does not make contact with her body, so discomfort shouldn't be an issue, but I wanted to see if any of you have tried this with any success. I had a harness that I tried that with for like a day lol. The harness was made by kong and was padded and had a little handle (that I wouldn't trust to actually lift a dog with). It was a total challenge to put on for one thing, and the middle / underneath strap didn't fit Ozzy at all, despite it being adjustable. It had a D ring in the back and an O ring in the front. I also wondered if it would cause discomfort, I thought about buying my own D ring to attach to the front. The harness just didn't even fit him right though, so I really only tried it while practicing indoors before I was like yeah this isn't going to work haha. Maybe it would work better now that he's grown, but I totally like the ezy dog quickfit harness that I'm using. It doesn't have a clip in the front which is a bummer. But I'm super stubborn about pulling haha, so I stop or sometimes turn around every single time. He doesn't pull at all except when excited people are approaching him haha. He loves people ahhh, and it's so awkward for me to be like "hi stranger, could you stop being excited about my dog and just chill out until he sits politely?" hahahah. Or there's the other option of just turning around when he's pulling toward them, but when they're approaching like "aww! What a cute dog!!" I would feel sooo rude just ignoring them and turning and walking away from them. So I'm planning on arming my friend with treats and "happening upon her" during a walk a several times and having him get rewards and attention when he's calm. Practicing in a controlled situation. Hopefully someone has more experience than me, my one day trial with a roman style harness isn't really helpful. xD I would see if you can try one on somewhere to make sure that under strap fits okay. Maybe it was just ill-fitting because Ozzy was such a little pup then, but worth trying out to see if it seems like a good fit. @pylea I never feel comfortable hooking Hazel up to a front ring like that after an incident that happened when she was around 6 months old. We were in New York City and a stranger bent down to pet her and she was able to back out of the harness. I do prefer securing her from the front though, so I clip her leash to both her harness and her collar. 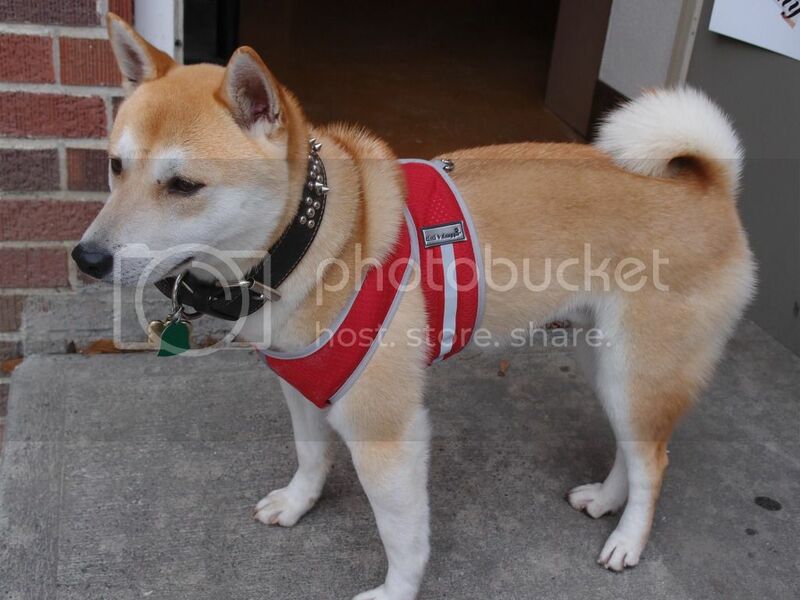 After a lot of experimentation I use the Easy Walk harness in size Small-Medium (in between a small and a medium and perfect for my 22 lb Shiba). It is also available in black which you like. This harness has some slack in a loop just the front which allows you to attach a leash to the front d-ring and a collar. I use a regular petco collar. Hazel seems very comfortable and has had no escapes. Thank you for your responses, @lilikoi and @hazel! I'm glad to know other people have tried it, because I was thinking, "why don't people do this?!??" @Hazel: That's super scary that Hazel was able to back out of her Roman harness. Backing away from a stranger, of course. :) My issue with the Easy Walk is that I read they might affect their gait while walking, because the straps are kind of low on the torso and could restrict leg movement. http://www.whole-dog-journal.com/issues/16_7/features/the-no-pull-debate_20782-1.html - I'm not sure if it's true and I know a lot of people love those harnesses, but I'm paranoid so I haven't gotten one. Also I think even the black ones have a silver bottom strap? Right now Pylea's harness is lavender but it gets soooo dirty, even with washings, so I'm going all black from now on. @Lilikoi: cute pic! Pylea's current harness is a Roman harness with an extra D-ring attached to the front, so it definitely works, it's just bulky. And after realizing I can just clip the leash to the O-ring I feel like the D-ring is a superfluous and I kind of want to cut it off, but honestly mostly for aesthetic reasons (and because I don't think it will affect function). @pylea Yeah it was horrible! It was in NYC so I was terrified shed get run over. Instead she ran down the block and into a boxing gym where the owners gave her treats every time she passed by. She ran past the front desk and went all the way into the back locker rooms where we caught her. I've had no issues with movement restriction in the Easy Walk. It is really important that it's tightened correctly and put on correctly. Sometimes I leave it on between walks and Hazel will sleep in all kinds of positions, and in the dog run she can run with no issues. I think if you use it with a collar, the collar hikes up the straps on the harness when leashed, making it easy for the dog to move. The shelter where I walk dogs also uses this combination of Easy Walk and collar, which is where I got the idea. I've had the same harness for over a year and the silver portion still looks pretty good. You can configure it so the silver is on top (across the dogs back) or the bottom (across the belly). About to spring for a Julius IDC -- which is supposed to be better for smaller dogs. Anyone have any sizing info they would like to share? I'm thinking Mini Mini size... Daktoa is about 19 lbs and about 20 inches around the girth. Anyone know if the IDC runs small or on the large size? Thanks! @DianaBoston I JUST got our Julius IDC harness today. We bought the Mini, but Pebbles is about 26 lbs and 21 inches around the girth (she's really long). It seems to be quite adjustable, but if you don't size it right, I could see it being a problem. I only had it on her for a few minutes at lunch time so I know it fits, I just haven't had a chance to adjust it well. They do have a sizing chart, and it seems to run true to size. The adjustable portions are under the chest and across the front of the chest, so the top padded portion (where the color is) doesn't seem to come down over her back and sides as far as I was expecting, but that is probably because I haven't seen any dogs that have one.